Gov. Jay Inslee gets a federal pension in addition to his gubernatorial pay, his tax returns show. Meanwhile, GOP challenger Bill Bryant’s business, port-commissioner salary and investments brought in three times the governor’s pay. Republican gubernatorial candidate Bill Bryant isn’t necessarily eyeing a big pay raise if he manages to unseat Democratic Gov. Jay Inslee in November. Bryant and his wife made nearly $650,000 in 2015 from business profits, investments and wages — more than three times what Washington’s governor is paid, according to their federal income-tax return. Bryant and Inslee each disclosed years of federal income-tax returns in response to a request from The Seattle Times. The documents offer snapshots of the rival candidates’ personal finances from contrasting careers: Inslee’s years in public office and Bryant’s work as founder of the trade-consulting firm Bryant Christie and his stint as a Port of Seattle commissioner. Inslee’s financial life has remained relatively simple, his returns show. In addition to his gubernatorial salary of about $170,000 in 2015, he’s getting a $43,000-a-year congressional pension. While Bryant is by far wealthier, both candidates make more than most Washington families. The median household income in the state last year was $62,100, according to the state Office of Financial Management. Bryant’s decision to release his returns from 2011-15 is a contrast to four years ago, when then-Attorney General Rob McKenna refused to disclose any of his returns while running as a Republican for governor. This year, GOP presidential nominee Donald Trump has broken with a long tradition for presidential candidates in refusing to divulge his tax returns. Bryant provided his form 1040s and schedules showing itemized deductions, interest earnings and dividends. He declined to provide additional tax schedules that would have provided a detailed breakdown of profits and losses attributable to his company. “There is some business proprietary information there,” he said, citing business-partner concerns. Inslee provided full tax returns and schedules filed jointly with his wife, Trudi, from 2012 through 2015. Previously they had released five years of earlier returns when he ran for governor in 2012. • Bryant and his wife, Barbara Feasey, reported joint income of between $395,000 and $732,000 annually between 2011 and 2015. That included his salary as a Port of Seattle commissioner through last year and her pay as an executive at the Woodland Park Zoo and later the Frye Art Museum, where she is director of operations. • In 2015, the couple paid about $155,000 in federal taxes on income of $650,000, for an effective tax rate of nearly 24 percent. • Bryant’s reported business earnings have climbed from $63,000 in 2011 to $433,000 last year. Bryant Christie, the 35-person company he founded in 1992, helps exporters sell agricultural products overseas. Its clients last year ranged from Washington winemakers to California tomato growers to Coca-Cola, according to a list provided to the state Public Disclosure Commission as part of a required financial disclosure by elected officials and candidates. • They’ve also profited from the stock market and other investments, reporting capital gains of $51,000 last year in addition to dividends and interest payments. • The couple has donated more than $50,000 a year on average since 2011 to charities. In 2015, they gave more than $64,000 in cash and stocks to causes that included food banks, conservation and arts organizations, the Fred Hutchinson Cancer Research Center and the Archdiocese of Seattle. • The Inslees in 2015 earned $219,000 and paid $34,000 in federal taxes — an effective tax rate of about 15.5 percent. Their tax returns show little in the way of income from investments or interest on savings. 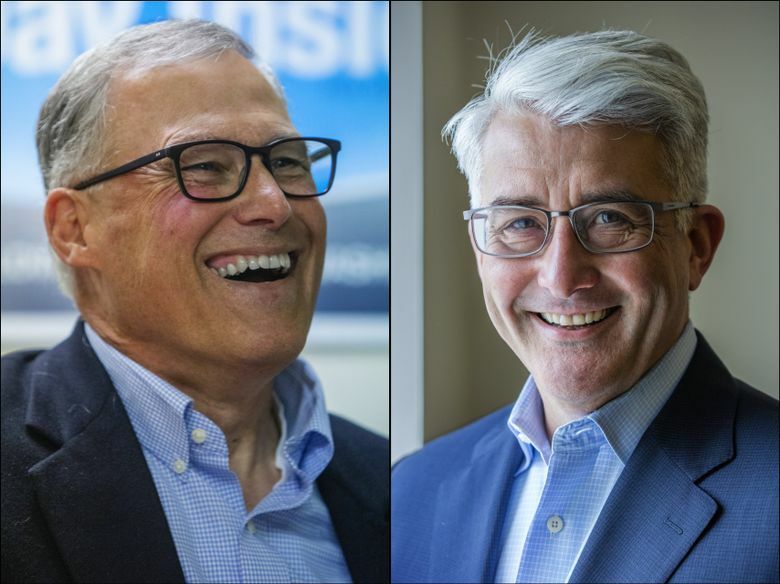 In addition to his gubernatorial salary and congressional pension, Inslee received a $12,000 life-insurance payment following the death of his father, Frank Inslee, according to campaign spokesman Jamal Raad. • The Inslees took an $88,000 withdrawal from an individual retirement account in 2012 to pay for living expenses while he ran for governor. He had resigned from Congress that March. • The Inslees have given an average of about $8,300 a year to charities over the past four years, according to their returns. Their donations went to nonprofit organizations including YouthCare and The Mockingbird Society, which aid homeless youth and foster children.